Currently the MAC-addresses on the boxes and on the stickers on the devices don't have any : or -, so just a series of numbers/letters. And yes you can easily work with QR codes, but older devices which have no QR codes available and got Nebula access via a firmware upgrade should be supported as well. It is not obvious at all in the Nebula app to add : or - between, so you just get an error message. The App should either state this in writing that the user has to add them in between, or make the entry field smart and it will use the MAC-address also without : or -. In the Nebula webportal it is a bit better, but in the template this comment is also not stated and you really have click on the link to open the explanation. I think this is crucial input info which should be visible at all times. But again, better make it smart so the user does not have to think how he/she enters de data. Our Nebula Mobile App and Web portal should auto-fill the colons (:) for MAC addresses. Typing a series of "aaaaaaaaaaaa" on the MAC address field and the App or Web portal will present "AA:AA:AA:AA:AA:AA". Are you perhaps using the old Nebula Mobile App? If so, please update the App through the Play/Apple Store. After further testing, we observed that the issue only occurs on iPhones. Android Phones work fine. There seems to be some inter-operability issues between the Nebula Mobile App and iOS. We will work to resolve this as soon as possible. Nebula Mobile 2.1 should now be available in the App store. 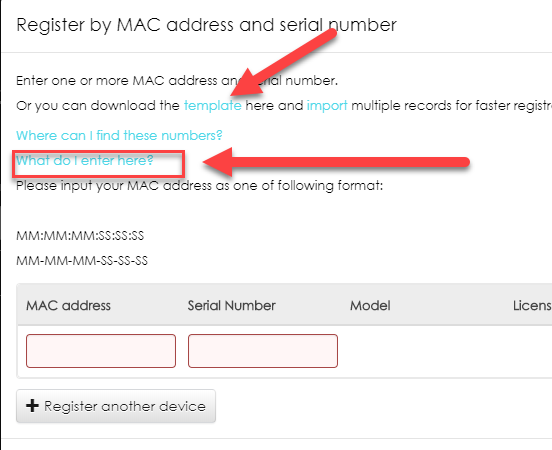 This update will not auto-fill the colons (:) on the MAC address field, however, you should be able to register your device just by inputting the MAC address without the colons.